Last Friday I had the opportunity to go visit the headquarters of Genius Factor Games and sit down with the CEO Ted Nugent to talk about their new release “Riese” for the iOS platform. 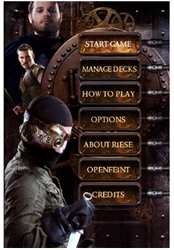 The game is based on “Riese The Series” web show, which has been picked up for digital broadcast by Syfy.com. Riese The Series will begin airing on October 26th under its new title, Riese: Kingdom Falling, and Riese the Game will be launched in the App Store at the same time. This entry was posted on Thursday, October 21st, 2010 at 8:56 am and is filed under Card Games, Everyone, Game Reviews, Mobile, National News, New Releases. You can follow any responses to this entry through the RSS 2.0 feed. You can leave a response, or trackback from your own site.